"Life before working with You&Co was really challenging. We felt pretty razzed that we had put together this website and when it started breaking on us, we just felt so out of our depth. It was really nice to call in someone who knew what they were doing." Weploy is a simple online platform that connects businesses looking to hire short-term support staff directly from a community of pre-screened candidates. Referred to as the Uber for jobs, Weployees are able to apply for the jobs that Weployers post by cutting out the middle person to provide fast and easy on-demand staffing solutions. Startups move, and they move fast. Moving at pace through an unbelievable growth phase saw Weploy scramble for accessible resources and a "bootstrapped" mentality which made it challenging to make updates to their site without breaking something. Think persisting stylesheet issues, broken website templates and unclear branding for their two-sided marketplace. Their speed was slowing and their frustration on the tools they were using was growing - there had to be a better way. You & Co were brought in to help Weploy with two key components of their business. One, to give Weploy a leg up by building a website that works for them, not the other way around. Two, and most importantly, to get the website to educate and qualify users. We started with the creation of an online, responsive style guide to tackle any misdirection around Weploys branding to allow for consistency, clear-cut communication across the board and a seamless and inviting user experience. We helped structure the site in a way that really boosted the user experience and allowed users on both sides of the platform to clearly and quickly understand what exactly Weploy is, and how it can help them. The long-term vision for Weploy is for it to be almost self-sufficient, and a big part of what we were looking to do here was to clearly educate users before they reach sales, and minimise the effort required to convert users. The challenges of marketing a two-sided marketplace and making the information architecture work clearly with the new branding pattern had the potential to undo all of Weploy’s hard work. Having two distinct audiences can make reaching the right ones at the right time a mammoth task. To augment the new website, implementing the devised branding adjustments for both sides of the marketplace gave users the ability to clearly navigate and identify which areas best served their needs. 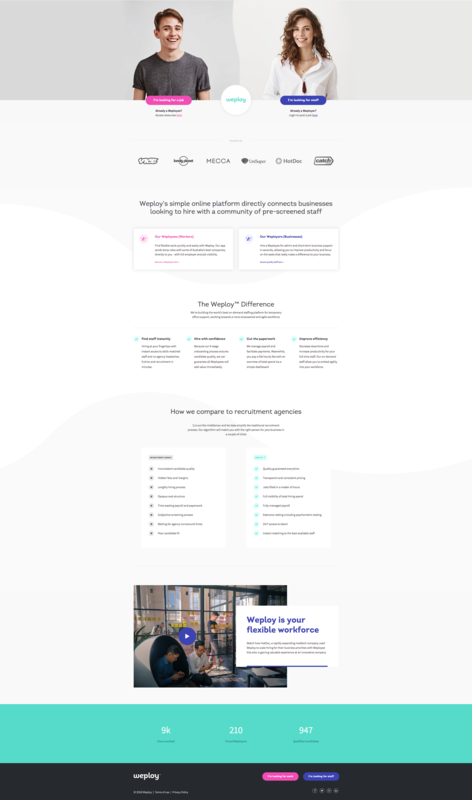 All the site pages were rebuilt through HubSpot to establish a single source of design truth and code, so now the team at Weploy can update almost everything without needing a developer involved. You & Co also helped Weploy champion relevant content and conversations across their site to build their following and instil the notion of community. One of the hero pieces of content, “The Essential Guide to On-Demand Staffing”, is a high-value resource for generating top notch leads for both Weployers and Weployees. Clear website strategy, detailed information architecture of site catering for the two-sided marketplace. Customisable and easily updated page templates, easing frustrations and saving time for the Weploy team. Consistent and clear visual style, distinct to each side of the platform giving clear direction to the audience.